Laser engraving is precise and exact. A flat surface cut out to throw the subject into relief will be perfectly flat, every contour will be true, every hair will be in place, the spaces between all hatched lines and dots will be equal, the same letter repeated will be identical to the first and two boars’ heads will match in every detail. By comparison a hand-engraved item will have a different form of perfection, something that is frequently called ‘indefinable’ - a master engraver will give the engraving life. The two letters will not be identical; the contours which define the neck muscles of a beast will look like muscles, not like a touched-up photograph. Hatched lines and dots will not be equidistant and you will be able to detect differences between the two boars’ heads. The basic outline shape of the ring is produced by die-stamping. This is done under great pressure compressing the metal so that it becomes extremely dense and hard, but it is not yet a ring; it is flat. Shaping this stamping is now the work of a skilled goldsmith who starts by forging the shape and size required: a process of heating and hammering, which further hardens and compresses the metal. 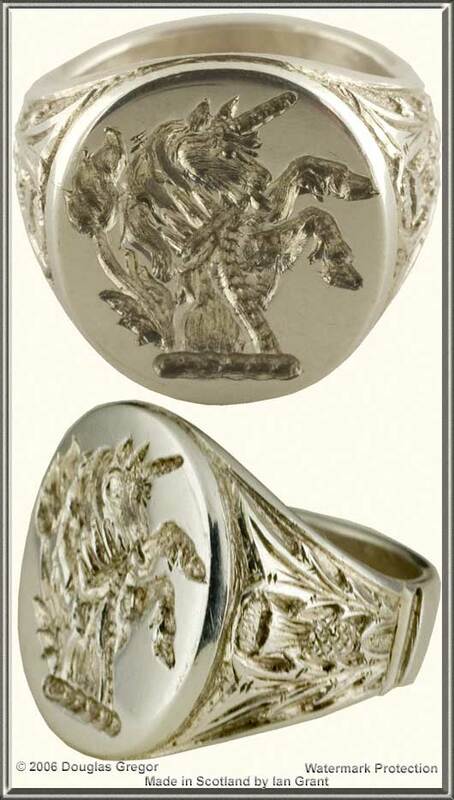 This done, the ring must now be dressed: the head and shoulders may have lost a little of their shape and will have been bruised; they are now filed back into shape and polished until they are ready for engraving. This can affect the head size and weight of the ring and so the figures we quote are approximate. Because the metal is harder and more dense the engraving will be precise and sharp. The final result is a much stronger, harder wearing ring than one made by casting and an engraving with much better definition. rings. A signet is a small sealWhen applied by wax to a letter or document, the seal would identify and authenticate its source.. When heraldy was introduced, the coat of arms became the ideal device for a seal, but not the only one. 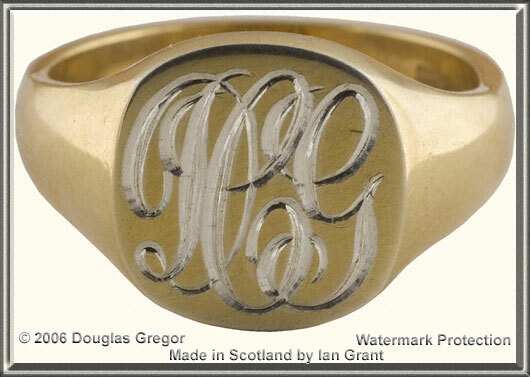 A monogram or heraldic crest, for example, are both suitable devices for a signet ring. We hand engrave the seal intaglioIntaglio: three dimensional engraving cut out entirely below the surface. and in reverseIn reverse: so when applied the seal leaves a three dimensional positive impression.. On the right is an example of a silver signet ring; the seal is an heraldic crest and the shoulders have been decorated with thistles engraved in cameoCameo: the background is cut away and the engraving is in relief. The signet ring illustrated has a large oval table (face) measuring 16 x 20mm (about ½ x ¾"). This is a good area on which the hand engraver can demonstrate his skills. Smaller signet rings are available. When a seal is not required a ring can be engraved with a positive image of your coat of arms, crest, monogram or other motif. 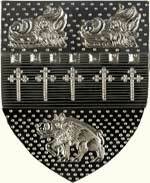 Hand engravings of the coat of arms of each chairman of the Scottish Heraldry Society are illustrated in our page about heraldic engraving. The ring on the right has been line-engravedTwo dimensional engraving on a flat surface The visual effect is created by reflected light. This is a positive image. with a cipherThe term, possibly best known for its reference to codes or "secret writing", describes the elaborate interlacing of characters. In our page entitled "Monograms" we illustrate both the cipher and the monogram.. This is a cushion ring with a table (face) measuring 14 x 13cm (about ½ x ½"). Smaller sizes are available. Rings with round and square tables are also available. The image on the right is hand engraved in silver gilt Silver gilt has been used for illustration purposes only, because cutting through the plating into the silver shows the engraving to better effect for the web. We offer these rings in Sterling silver, 9ct yellow gold and some in 18ct yellow gold. 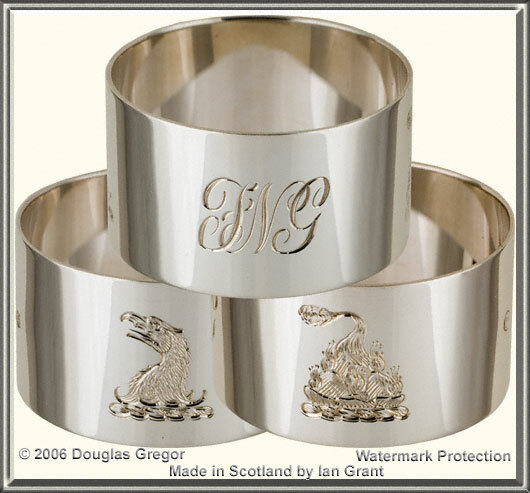 A traditional gift at a child’s christening in Scotland is an engraved silver napkin ring. The rings here measure 45mm in diameter (about1¾") with a band height of 26mm (about 1"). The top ring is engraved with a cipher of the child’s initials, the other two are engraved with crestsBlazons: on the left is an "Eagle’s head erased, proper" and on the right a "Burning mount, proper". We use this plain style of ring so that nothing detracts from the engraving.